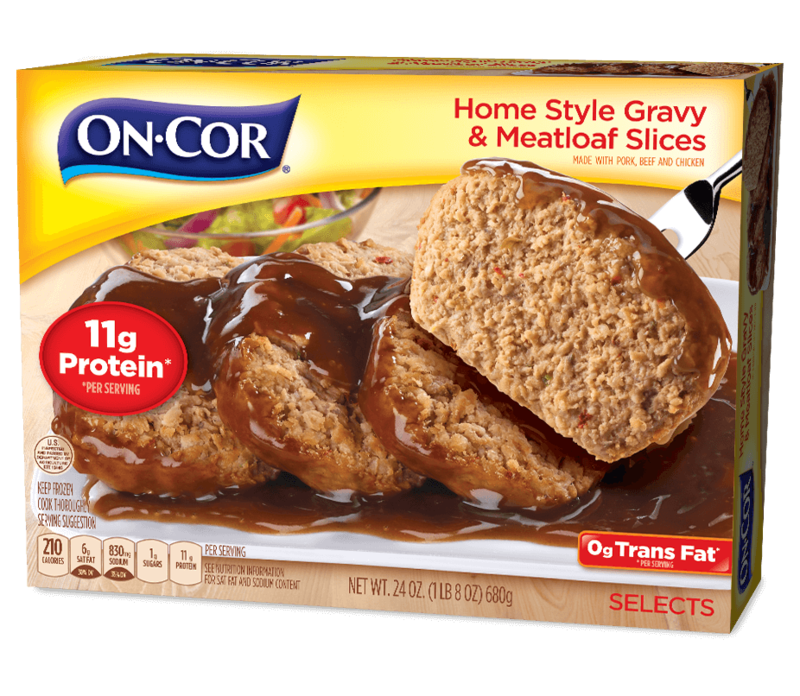 Hearty slices of tender meatloaf with rich home style gravy. Made with pork, beef and chicken. Meatloaf Slices: Pork, beef, water, chicken, textured soy protein concentrate, tomato ketchup (tomato concentrate from red ripe tomatoes, distilled vinegar, sugar, salt, onion powder, spice, natural flavoring), soy protein concentrate, contains less than 2 % of the following: maltodextrin, hydrolyzed soy and corn protein, salt, dehydrated onion, dehydrated garlic, natural flavor, yeast extract, spice, spice extractive, beef stock, modified corn starch, rendered beef fat, enzyme modified butter, flavor, dehydrated onions, dehydrated green and red peppers, sodium phosphate, bleached wheat flour, caramel color. Stir gravy, then spoon gravy over slices and heat for 35 to 40 minutes more or until the internal temperature reaches 165°F as measured with a food thermometer in several spots. Carefully peel back film, separate any portions still frozen, stir gravy and spoon it over slices. Heat on HIGH for 4 to 6 minutes or until fully cooked. I make a shepherd's pie style meal. Just add drained, canned carrots to the gravy and top with mashed potatoes and cheddar cheese for a casserole style meal with a twist. I am always on the lookout for marked down veggies sometimes I can get organics for $0.99 and I always stock up at store closeouts. A lot of those veggie items are 1/3 their regular price! "I am a caregiver to my mom and stay home with the kids. You help me put a good dinner on my table."